Paleomagnetism is famous for its use of a large number of incomprehensible acronyms. Here we have them gathered together along with definitions and the Section numbers where they are explained in more detail. You will find here a table of physical constants and paleomagnetic parameters used in the text as well as a table listing common statistics used in paleomagnetism. After the tables, there are a few sections with useful mathematical tricks. Table A.1: Acronyms in paleomagnetism. Table A.2: Physical Parameters and Constants. Rx IRM cross-over value: Section ?? Table A.3: Common statistics in paleomagnetism. In this section, we have assembled assorted mathematical and plotting techniques that come in handy through out this book. 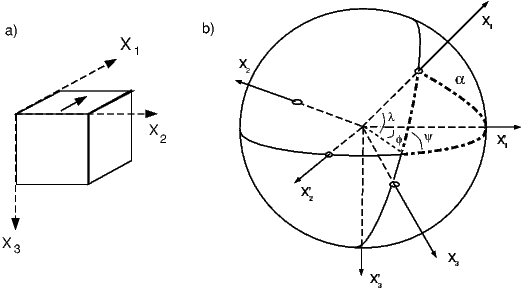 Spherical trigonometry has widespread applications throughout the book. It is used in the transformations of observed directions to virtual poles (Chapter 2) and transformation of coordinate sytems, to name a few. Here we summarize the two most useful relationships: the Law of Sines and the Law of Cosines. Figure A.1: Rules of spherical trigonometry. a,b,c are all great circle tracks on a sphere which form a triangle with apices A,B,C. 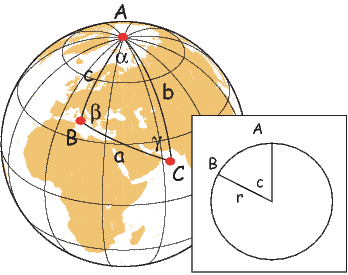 The lengths of a,b,c on a unit sphere are equal to the angles subtended by radii that intersect the globe at the apices, as shown in the inset. α,β,γ are the angles between the great circles. 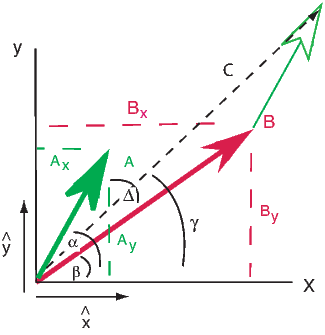 Figure A.2: Vectors A and B, their components Ax,y, Bx,y and the angles between them and the X axis, α and β. The angle between the two vectors is α -β = Δ. Unit vectors in the directions of the axes are and ŷ respectively. To subtract two vectors, compute the components as in addition, but the components of the vector difference C are: Cx = Ax - Bx,Cy = Ay - By. There are two ways to multiply vectors. The first is the dot product whereby A ⋅ B = AxBx + AyBy. This is a scalar and is actually the cosine of the angle between the two vectors if the A and B are taken as unit vectors (assume a magnitude of unity in the component calculation. Figure A.3: Illustration of cross product of vectors A and B separated by angle θ to get the orthogonal vector C.
Vectors belong to a more general concept called tensors. While a vector describes a magnitude of something in a given direction, tensors allow calculation of magnitudes as a function of orientation. Velocity is a vector relating speed to direction, but speed may change depending on direction, so we might need a tensor to calculate speed as a function of direction. Many properties in Earth science require tensors, like the indicatrix in mineralogy which relates the speed of light to crystallographic direction, or the relationship between stress and strain. Tensors in paleomagnetism are used, for example, to transform coordinate systems and to characterize the anisotropy of magnetic properties such as susceptibility. We will cover transformation of coordinate systems in the following. The first subscript always refers to the X system and the second refers to the X′. 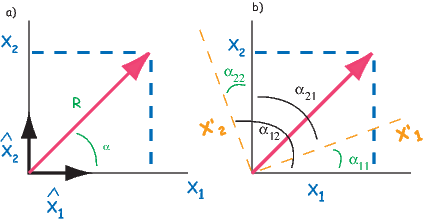 Figure A.4: Definition of direction cosines in two dimensions. a) Definition of vector in one set of coordinates, x1,x2. b) Definition of angles relating X axes to X′. with a short cut notation as: x′i = aijxj. However we write this, it means that for each axis i, just sum through the j’s for all the dimensions. The matrix aij is an example of a 3 x 3 tensor and equations of the form Ai = BijCj relating two vectors with a tensor will be used throughout the book. A more common notation is with bold-faced variables which indicate vectors or tensors, e.g., A = B ⋅ C.
The declination and inclination can be calculated by inserting these values in the equations in Chapter 2. Given the coordinates of the point on the globe Pp with latitude λp, longitude ϕp the finite rotation pole Pf with latitude λf, longitude ϕf, the way to transform coordinates is as follows (you should also review Appendix A.3.5). Convert the latitudes and longitudes to cartesian coordinates by: where P is the point of interest. The coordinates of the transformed pole (Pt) are: which can be converted back into latitude and longitude in the usual way (see Chapter 2). Convert the D, I, and M for a set of data points (e.g., a sequence of demagnetization data, or a set of geomagnetic vectors or unit vectors where M = 1) to corresponding xi values (see Chapter 2). where N is the number of data points involved. Note that for unit vectors, the center of mass is the same as the Fisher mean (Chapter 11). where x′i are the transformed coordinates. The three possible values of τ (τ1,τ2,τ3) can be found with iteration and determination. 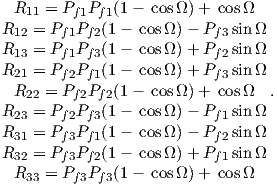 In practice, there are many programs for calculating τ. My personal favorite is the Numpy Module for Python (see many free websites, especially Scientific Python (SciPy) for hints). Please note that the conventions adopted here are to scale the τ’s such that they sum to one; the largest eigenvalue is termed τ1 and corresponds to the eigenvector V1. Inserting the values for the transformed components calculated in equation A.16 into T gives the covariance matrix for the demagnetization data. The direction of the axis associated with the greatest scatter in the data (the principal eigenvector V1) corresponds to a best-fit line through the data. This is usually taken to be the direction of the component in question. 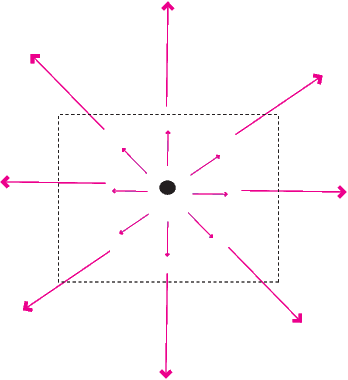 This direction also corresponds to the axis around which the “moment of inertia” is least. The eigenvalues of T are the variances associated with each eigenvector. Thus the standard deviations are σi = . We often wish to differentiate a function along three orthogonal axes. 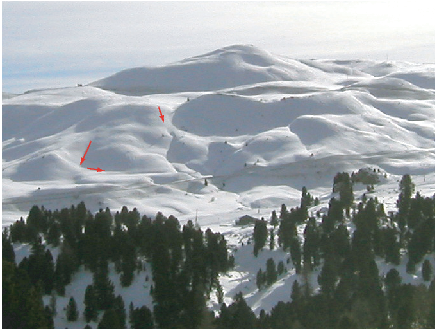 For example, imagine we know the topography of a ski area (see Figure A.6). For every location (in say, X and Y coordinates), we know the height above sea level. This is a scalar function. Now imagine we want to build a ski resort, so we need to know the direction of steepest descent and the slope (red arrows in Figure A.6). Figure A.6: Illustration of the relationship between a vector field (direction and magnitude of steepest slope at every point, e.g., red arrows) and the scalar field (height) of a ski slope. Figure A.7: Example of a vector field with a non-zero divergence. Like all dot products, the divergence of a vector function is a scalar. Figure A.8: Example of a vector field with zero divergence. 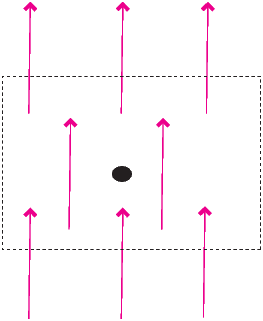 Figure A.9: Example of a vector field with non-zero curl. The name divergence is well chosen because ∇⋅ H is a measure of how much the vector field “spreads out” (diverges) from the point in question. In fact, what divergence quantifies is the balance between vectors coming in to a particular region versus those that go out. The example in Figure A.7 depicts a vector function whereby the magnitude of the vector increases linearly with distance away from the central point. An example of such a function would be v(r) = r. The divergence of this function is: (a scalar). There are no arrows returning in to the dashed box, only vectors going out and the non-zero divergence quantifies this net flux out of the box. The zero divergence means that for every vector leaving the box, there is an equal and opposite vector coming in. Put another way, no net flux results in a zero divergence. The fact that the divergence of the magnetic field is zero means that there are no point sources (monopoles), as opposed to electrical fields that have divergence related to the presence of electrons or protons. Curl is a measure of how much the vector function “curls” around a given point. The function describing the velocity of water in a whirlpool has a significant curl, while that of a smoothly flowing stream does not. or So there is a positive curl in this function and the curl is a vector in the ẑ direction. The magnetic field has a non-zero curl in the presence of currents or changing electric fields. In free space, away from currents (lightning!! 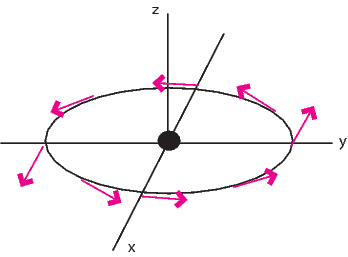 ), the magnetic field has zero curl. Sometimes things just are not normal. Statistically that is. When you can not assume that your data follow some known distribution, like the normal distribution, or the Fisher distribution, what do you do? In this section, we outline a technique called the bootstrap, which allows us to make statistical inferences when parametric assumptions fail. The reader should also refer to Efron and Tibshirani (1993) for a more complete discussion. In Figure A.10, we illustrate the essentials of the statistical bootstrap. We will develop the technique using data drawn from a normal distribution. First, we generate a synthetic data set by drawing 500 data points from a normal distribution with a mean x of 10 and a standard deviation σ of 2. The synthetic data are plotted as a histogram in Figure A.10a. In Figure A.10b we plot the data as a Q-Q plot (see Appendix B.1.5) against the zi expected for a normal distribution. The data in Figure A.10a plot in a line on the Q-Q plot (Figure A.10b). The value for D is 0.0306. Because N = 500, the critical value of D, Dc at the 95% confidence level is 0.0396. Happily, our normal distribution simulation program has produced a set of 500 numbers for which the null hypothesis of a normal distribution has not been rejected. The mean of the synthetic dataset is about 10 and the standard deviation is 1.9. The usual Gaussian statistics allow us to estimate a 95% confidence interval for the mean as �1.96σ∕ or �0.17. In order to estimate a confidence interval for the mean using the bootstrap, we first randomly draw a list of N data by selecting data points from the original data set. This list is called a pseudo-sample of the data. Some data points will be used more than once and others will not be used at all. We then calculate the mean of the pseudo-sample. We repeat the procedure of drawing pseudo-samples and calculating the mean many times (say 10,000 times). 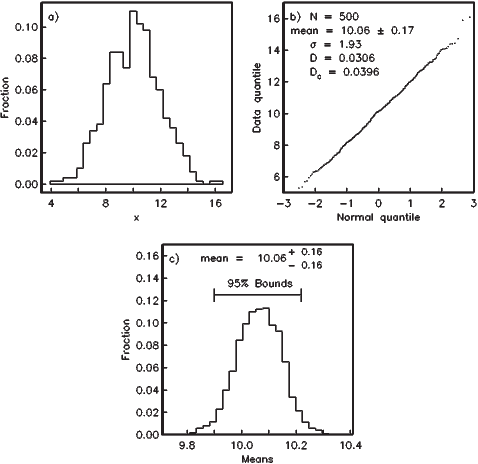 A histogram of the “bootstrapped” means is plotted in Figure A.10c. If these are sorted such that the first mean is the lowest and the last mean is the highest, the 95% of the means are between the 250th and the 9,750th mean. These therefore are the 95% confidence bounds because we are approximately 95% confident that the true mean lies between these limits. The 95% confidence interval calculated for the data in Figure A.10 by bootstrap is about � 0.16 which is nearly the same as that calculated the Gaussian way. However, the bootstrap required orders of magnitude more calculations than the Gaussian method, hence it is ill-advised to perform a bootstrap calculation when a parametric one will do. Nonetheless, if the data are not Gaussian, the bootstrap provides a means of calculating confidence intervals when there is no quick and easy way. Furthermore, with a modern computer, the time required to calculate the bootstrap illustrated in Figure A.10 was virtually imperceptible. In a sun compass problem, we have the direction of the sun’s shadow and an angle between that and the desired direction (α). The declination of the shadow itself is 180∘ from the direction toward the sun. 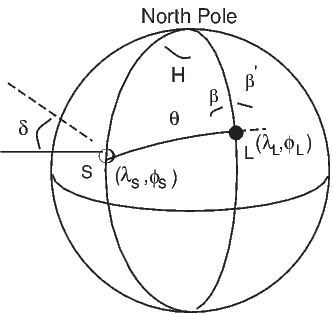 In Figure A.11, the problem of calculating declination from sun compass information is set up as a spherical trigonometry problem, similar to those introduced in Chapter 2 and Appendix A.3.1. The declination of the shadow direction β′, is given by 180 - β. We also know the latitude of the sampling location L (λL). We need to calculate the latitude of S (the point on the Earth’s surface where the sun is directly overhead), and the local hour angle H.
The mean anomaly g = 357.528 + 0.9856003d (in degrees). Put ϕs and g in the range 0 → 360∘. The longitude of the ecliptic is given by ϕE = ϕs + 1.915sing + 0.020sin2g (in degrees). The obliquity of the ecliptic is given by ϵ = 23.439 - 0.0000004d. where f = 180∕π and t =tan2ϵ∕2. Finally, the equation of time in degrees is given by E = 4(ϕs - A). If λs < λL, then the required angle is the shadow direction β′, given by: β′ = 180 - β. The azimuth of the desired direction is β′ plus the measured shadow angle α.